A marksman learns to shoot by first taking aim at large objects; the better he gets, the easier it becomes to hit smaller things. So when the mind has been trained to fix on images with form, it becomes easier to fix it upon images having no form. See the notes to "A Bell Rings With and Without Form." A boy begins to learn writing by drawing big scrawls, before he can master a finer hand. So we must learn concentration of the mind by fixing it first on forms; and when we have attained success at that, we can more easily fix it upon the formless. While a bell is being rung, the repeated "ding-dongs" can be distinguished from each other. But when we stop ringing the bell, then we can only hear an indistinguishable sound. In the first case, we can easily distinguish one note from the other, as if each distinct note had a certain shape; but in the second, the continued and unbroken sound is as though formless. Like the sound of the bell, God is both with and without form. This is the first of several sayings about God being with form and without form. This is a standard distinction in Indian thought, "Saguna Brahman" being God With Attributes, and "Nirguna Brahman" being God Without Attributes. Sri Ramakrishna affirms that thinking of God in either way is acceptable, but seems to assert that seeing God With Attributes is provisional, immature; and seeing God Without Attributes is the superior way. Still, looking back at the previous saying, we can feel assured that either way, God will be pleased. A landlord may be very rich, but nevertheless, when a poor farmer brings a humble gift to him with a loving heart, he accepts it with the greatest pleasure and satisfaction. Do you remember giving gifts to your mother when you were a child? No matter how ill-made, the gift was praised. Many of us feel unworthy to approach God, feeling that our "gifts" are not enough. Sri Ramakrishna here affirms that God will be pleased, no matter how small the gift. A man was sitting in the shade of a Wishing Tree. First, he wished to be a king, and in an instant he was a king. The next moment he wished to have a charming woman, and the woman was instantly by his side. But then he thought to himself, "What if a tiger came and devoured me?" and alas! in an instant he was in the jaws of a tiger! God is like that Wishing Tree: whoever thinks in God's presence that he is destitute and poor will remain so; but the one who believes that the Lord fulfils all his needs, will receive everything from Him. The "Wishing Tree" is the Kalpa-vriksha, a standard item in Indian mythology (and many others). Like many such "magic" items, however, it has a hidden danger; "be careful what you wish for..."
There are traces here of the so-called "Law of Attraction," but I suspect that Sri Ramakrishna would have found many modern statements of the LOA shallow and self-serving. As a plunger in a syringe, God dwells in the body. He is in the body, and yet apart from it. As fishes playing in a pond covered over with reeds cannot be seen from outside, so God plays in the heart invisibly, hidden from human view by Maya. I have joined together two sayings. Maya is "illusion," the illusion that prevents us from seeing the reality of things. God says, "I am the snake that bites and the charmer that heals; I am the judge that condemns and the executioner that whips." God tells the thief to go and steal, and at the same time warns the householder against the thief. I have combined two short sayings here. The first half reminds me of a James Taylor song, "New Hymn," in which he refers to God as "source of all we hope or dread: sheepdog, jackal, rattler, swan," and Blake's "The Tyger," in which he asks, "Did he who made the lamb make thee?" In the second, we see God as agent on both sides of every struggle, giving the lie to the "God is on our side" war cry. Together, these two give us a much bigger picture of God than the one most of us grew up with. Many have merely heard of snow but have not seen it. So, many "spiritual teachers" have only read about God in books, but have not realized God in their lives. Many may have seen snow but have not tasted it. So, many "spiritual teachers" have glimpsed the Divine Glory, but have not understood its real essence. One who has tasted snow can say what it is like. One who has communed with God in different aspects, now as a servant, now as a friend, now as a lover, now absorbed in God, that one alone can talk knowledgably of the essence of God. Joseph Campbell makes a distinction between the "priest," a social functionary who has been trained to perform his role, and the "shaman," who mediates a direct experience with God. All teachers, Ramakrishna says, should be shamans. illicit love, the highest of all, that throws away everything for love. One who loves God in all these ways is ready to teach. Everything is God. Human or animal, sage or scoundrel, in fact, the entire universe, is God, the Supreme Spirit. The name of God used here is Narayana, meaning Vishnu, whose avatar Krishna is one of the best-loved in India. It is surprising to think that a "scoundrel" (the original text that I am paraphrasing uses "knave") is also the beloved "Supreme Spirit." Again, to cast it in Christian terms, there would be no more of God in Jesus than in the criminals between whom he hung on the cross. God, his scripture, and his devotees, are all to be regarded as one, that is, in one and the same light. This short but profound saying is manifold in meaning. There is no distinction between God and his scriptures (specifically the Bhagavad Gita in this saying). There is no distinction between the scriptures and the believer; or between the believer and God. In Christian terms, Jesus is the Word of God, as is the Bible. But take one more step: so are we. A Master told his pupil: "Everything that exists is God." The pupil took it literally, not in the true spirit. While he was walking down a street, he met with an elephant. The mâhut (the driver) shouted aloud from his high seat, "Move away, move away!" The pupil argued in his mind, "Why should I move away? I am God, and the elephant is also God. What need has God to fear Himself?" Thinking this he did not move. Finally the elephant picked him up with his trunk, and dashed him aside. Severely hurt, he went back to his Master, and told him the whole story. The Master said, "All right, you are God. The elephant is God also. But God in the shape of the elephant-driver was warning you also from above. Why did you not pay heed to his warnings?" As Pope wrote, "A little knowledge is a dangerous thing." And so a student with limited understanding can become worse off than one with no knowledge at all. It is true that God is even in the tiger, but we must not go and face the animal. So it is true that God dwells even in the most wicked, but it is not proper that we should associate with the wicked. The manifestation of the Divinity must be understood to be in greater degree in those who are honored, respected, and obeyed by a large following, than in those who have gained no such influence. These are actually two sayings; I put them together as a nice counterpoint. Sri Ramakrishna seems to be pointing to the idea the Buddhists call "The Two Truths." From the Godly perspective ("Absolute Truth"), all people are the same. But from our perspective ("Conditioned Truth"), distinctions must be made, for our own good. Labels: "All religions lead to Truth"
All waters are brooded over by Vishnu, but every kind of water is not fit for drink. Similarly, though it is true that the Almighty dwells in every place, yet every place is not fit to be visited by man. As one kind of water may be used for washing our feet, another may serve the purpose of ritual cleansing, and others may be drunk, and still others may not be touched at all; so there are different kinds of places. We may approach some; we can enter into the inside of others; and others we must avoid, even from a distance. The name in the first sentence is actually "Narayana," a less familiar but extremely important name of Vishnu. I have used the more familiar name of the supreme god of the Vaishnava tradition here. The emphasis here is on various places we might go, as in the next saying it will be on the people we associate with. Man is like a pillowcase. The color of one may be red, another blue, another black, but all contain the same cotton. So it is with man--one is beautiful, one is not; another is holy, a fourth wicked; but the Divine dwells in them all. In this saying, Sri Ramakrishna emphasizes the divinity in all people, without distinction. As we'll see later, this is to be tempered with some discrimination. Someone asked: "If the God of every religion is the same, why is it that God is painted differently by different devotees?" Sri Ramakrishna answered: "God is one, but His aspects are different. Just as one man is father to his children, brother to his siblings, and husband to his wife, and is called by these different names by those different people, so one God is described and called in various ways according to the particular aspect in which He appears to His particular worshipper." Little need be added. We are all aware of our different "selves," the masks we put on for our different roles. As the same sugar is made into various figures of birds and beasts, so one sweet Mother Divine is worshiped in various times and places under various names and forms. Different creeds are simply different paths to reach the Almighty. As the same gold is made into various ornaments, having different forms and names, so one God is worshiped in different countries and ages, and has different forms and names. Though He may be worshiped variously, some calling him Father, others Mother, etc., yet it is one God that is being worshiped in all these various relations and modes. In a potter's shop there are vessels of different shapes and forms--pots, jars, dishes, plates, etc.--but all are made of one clay. So God is one, but is worshipped in different times and places under different names and aspects. God is one, but his aspects are many. One and the same fish may be made to taste differently, according to the different modes of preparing it; so one God is enjoyed in His various aspects by His devotees. These are actually four sayings put together. The model could be repeated ad infinitum. Four blind men went to "see" an elephant. One touched the elephant's leg, and said, "The elephant is like a pillar." The second touched the trunk, and said, "The elephant is like a thick stick or club. " The third touched the belly, and said, "The elephant is like a big jar." The fourth touched the ears, and said, "The elephant is like a winnowing basket. " So they began to argue with each other as to what an elephant was like. A passer-by, seeing them quarreling, asked, "What are you arguing about? " They told him everything, and begged him to settle the matter. He said, "None of you has seen the elephant properly. "The elephant is not like a pillar; its legs are like pillars. "It is not like a thick stick or club; but its trunk is. "It is not like a big water-vessel; its belly is like a water-vessel. "It is not like a winnowing basket; its ears are like winnowing baskets. The elephant is the combination of all these." In the same manner those quarrel who have seen one aspect only of the Deity. the statement of the moral is variously worded. But they all mean the same thing: Our vision is limited, and we tend to take our limited version as the whole story. Even this parable has many manifestations; how much more so God? There's a sweet version of the story in verse here. It follows closely the story as I tell it. A man went into the forest, where he saw a beautiful red lizard on a tree. Returning to town, he told his friend about it. "Where?" his friend asked. "I want to see it too." So the first man told his friend it was on such-and-such a tree, in so-and-so a clearing. It would be easy to find, as a holy man often sat under that tree. The friend returned, and agreed that it was a very beautiful lizard. "Except," he said, "it was not red. It was green!" They discussed this, and soon the discussion became a violent argument. So they agreed to return to the holy man, and ask him about the lizard. The first man said to the holy man, "Sir, isn't the lizard who lives in that tree red?" "Yes," said the holy man. But the second man said, "What did you say? How is that? It is not red, it is green!" The holy man again humbly replied, "Yes, sir, it is." The holy man knew that the lizard, a chameleon, changes its color constantly, and so it was that he said "yes" to both of these conflicting statements. The Sat-Chit-Ananda likewise has various forms. The devotee who has seen God in one aspect only, knows Him in that aspect alone, and will argue that this is the only form. But he who has seen Him in all His manifold aspects, he alone can say, "All these are forms of one God, for God is multiform." He may be with form or without form, and many are His forms which no one knows. "Many are the names of God, and infinite the forms that lead us to know Him. In whatsoever name or form you desire to call Him, in that very form and name you will see Him." Let me remind you that "Sat-Chit-Ananda" is "Being-Consciousness-Bliss," the three key attributes of transcendent reality. One and the same material, such as water, is called different names by different people. One calls it "water," another "bari," a third "aqua," and another "pani." So the one Sat-chit-ananda, the Being-Consciousness-Bliss, is invoked by some as God, by some as Allah, by some as Hari, and by others as Brahman. "God" here may be the Judeo-Christian God (Sri Ramakrishna knew Christianity well); "Allah" is of course Muslim; "Hari" is the Hindu god Vishnu/Krishna (the Vaishnava greeting "Haribol!" means "Chant Krishna's name"); and Brahman is the impersonal concept of God in Hinduism. Finally, on "Sat-Chit-Ananda": This refers to the key attributes of the transcendent reality (Brahman), and the goal of any yogi. Books could be written about this, and we'll visit it again. A word on translation: I'm using a 19th-century text translated by Max Muller. I'm sure he took some liberties with the original, to help his audience. So what I'm giving you here is a paraphrase of a liberal translation. But I think the ideas still hold. Can You See the Stars in the Daytime? You see many stars in the night sky, but cannot find them at midday. Can you say, then, that there are no stars in the heavens in the daytime? So even though we humans do not see the Almighty in the daylight of our ignorance, we must not say, "There is no God." We start with a great example of the common-sense, humble nature of Sri Ramakrishna's sayings. Sure the skeptic can pick this apart: "We can't see the stars because the sun is brighter. What is brighter than God?" etc. But it's a beautiful illustration nonetheless. The full panoply of the kosmos is up there, all day long. And we're so blinded by what is near us (our daily worries, perhaps?) that we can't see it. Indian holy man Sri Ramakrishna (1836-1886) was a mystic who saw the Truth behind all religions. His teachings led to the creation of the Vedanta Society. 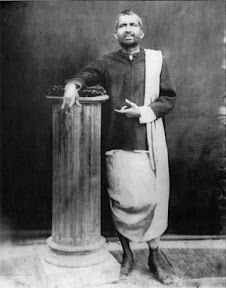 Although he could read and write Bengali, Sri Ramakrishna could not be called an "educated" man. Therefore, he spoke in simple parables, made humble analogies, and told homely tales with messages clear to his audiences (many of whom were in fact highly educated). In this page, I will share many of these sayings, with some simple reflections on their meaning. I hope that his words will come through as clear to us in English as they did to his Bengali listeners. I have modified these texts from the "Sayings" section of F. Max Muller's Ramakrishna: His Life and Sayings found at The Internet Sacred Text Archive. I have also used several books in my library for sources and deeper understanding. Any errors are mine, as are the copyright to this version and the comments. You can read a brief biography I've written. He was born February 18, 1836, in Kamarpukur, West Bengal, an hour or so west of Kolkata (Calcutta) by car. After a conventional education in the village school, he rejected "bread-winning education." More to his liking was the education received from the many wandering monks and renunciates who passed through his village on pilgrimage. The first of several childhood ecstatic states was reported at age 6; at age 18 he began working as a priest in Dakshineswar near Calcutta under his older brother Ramkumar. A year later his brother died, and Ramakrishna became the priest of the Kali Temple at Dakshineswar, where he remained the rest of his days. More mystic than administrator, he sought a vision of Kali (a goddess of death and destruction whom he came to consider as "Mother") with all his heart. These excessive devotions caused his birth mother and another elder brother, Rameswar, to fear for the stability of his mind. To "save" him, they arranged a marriage with Saradamani Mukhopadhyaya (later known as "Sarada Devi") when she was just five years old; when she was 18 (and he 35) they began living together at Dakshineswar. Far from distracting him from his mission, the marriage enhanced Ramakrishna's spirituality. The union was never consummated physically--Sarada Devi lived in a separate room in the temple--but her companionship focused his thoughts. Ramakrishna addressed his wife as "Sri Ma" (Holy Mother), and considered her to be an incarnation of the Divine Mother. Deeply rooted in "Hindu" spirituality, Sri Ramakrishna also experienced aspects of other religions, including Christianity and Islam, going so far as to have visions of the Prophet Muhammad and Jesus Christ. But his primary practices were Tantra and shakti, Vaishnava Bhakti, and above all Advaita Vedanta. Indeed, the large group of followers that surrounded him were organized after his death (on August 16, 1886) into the Ramakrishna Order and Ramakrishna Mission, known in America as he Vedanta Society. For more on his life, Wikipedia has a longer article, and a Vedanta Society site has information on Sri Ramakrishna's life, teachings, and order.